Green in colour, oblong in shape, tender skin, jagged ridges, gentle undulations, triangular teeth, warty surface, central cavity filled with pith and seeds, turns orange-red when ripe, bitter to taste…Mother Nature’s caring gift for us to be in the pink of health. Go bang the store for this veggie, Bitter Gourd, and chill out in the kitchen with this one of a kind cool dish for sweltering summer: Raitha. 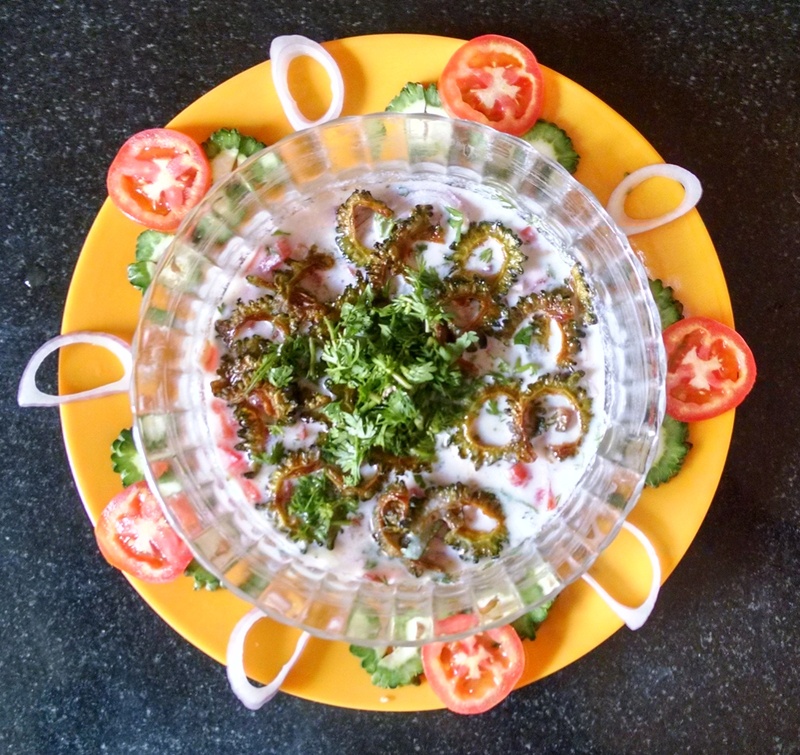 Raitha (or Raita) is a popular Indian side dish that is made using curd (or yogurt) and served as sauce, salad or a dip. Salt to taste ½ tsp approx. Wash bitter gourd, tomato, green chilly, coriander leaves and curry leaves thoroughly in salt water. Transfer them to a colander to drain the water. Chop bitter gourd into thin round slices or slit the gourd lengthwise and cut into thin 1” long slices. Heat oil in a kadai. Add mustard seeds. When they crackle, add curry leaves, bitter gourd slices and turmeric powder. Sauté for about 10 min. Now add salt and resume sautéing for another 10 min. in low flame. Keep alternating between high and low flame while sautéing. Meanwhile, fine chop onion, tomato and coriander leaves separately into small pieces. Slice green chilly into thin round pieces. Take a bowl. Add curds, salt, chilli powder and the above chopped ingredients into it. Just before serving add brown fried and crispy bitter gourd slices into it. Bitter Gourd Raitha is now ready. Bitter melon, balsam pear, balsam apple, art pumpkin, cerasee, carilla cundeamor, African cucumber, ampalaya, balsambrine, balsamine, balsamo, bitter apple, bitter cucumber, bittergurke, carilla fruit, carilla gourd, chinli-chih and many more. Photo looks amazing! Can’t wait to try this recipe!